You know what RockBox is don't you? it's the greatest open source firmware available on the net :) yep yep, it just works as it should, and the most important it has a file browser integrated, so its a lot easier to keep your music the way it should be. So when I first got my iPod 5g (60Gb) to tell you the truth I was surprised how limited the Apple's firmware was, and because I always like to be able to change the things that I use, I installed rockbox on my ipod as soon as possible. There are a lot of themes available for the 5g, but I found a great one on a forum so I decided to port this theme to 5g. This theme is a port of the "another .wps wannabe!" theme, I'm not sure who did this theme, but here is the link where I found it: http://www.misticriver.net/showthread.php?t=38075 so most of the credits go to GTS-R and I would specially thank him for including the .pds file in the zipped theme it made my work a lot easier! I hope you will enjoy it as I do, all patches work with today's rockbox cvs (20060617), I will try to keep them updated but for I have a lot of other works there may be problems, so don't hesitate to contact me if you need any help. ps: if I forgot something for e.g. give credits to someone please contact me. "I was confused on how to properly install, all you have to do is download the theme itself and the modified prebuild binary. The patches are posted strictly for those interested in modifiying them. You can find a .tar opener for Windows called Stuffit. Works well though it's only a trial. -Matt"
Hi, when I use current (daily) CVS and try to patch scroll_margins against it, it fails to compile. Do you have a link to the latest release? There is A LOT of nice improvements for iPod in CVS, so, if you could provide and updated binary, it would be marvellous. I tried to make a patch file with my modifications to the scroll margins patch, you can get it from here but there may be problems with it, so if you find something don't hesitate to contact me. and I already added the new patch to my binnary, just there are some problems because the patches conflict with eachother, so I have to work that out, but you should have the new binaries by this weekend. Now unpack the content of the zip file to your ipod, and when asked to overwrite the files say "Yes". and unpack it onto your ipod's .rockbox/ directory. Now unplug your ipod, power it up and go to the for e.g. 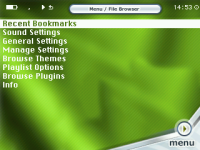 Menu->Browse Themes->Green5g and select it, and now you should see the green5g theme on your ipod. Then I had a look at your Green5g-20060612 WPS theme. I think your album art tag in that WPS is wrong. What are the '[' and ']' for? I assume you misinterpreted the album art documentation. P.S. : if you like to answer, please do it at the official rockbox forum! The custom-font_height-20060417.patch was used for defining a custom font height for the scrolling marings so you could trick out the line by setting it's hight to 5 so the next line got an upper y coordinate, but this isn't needed anymore because we have now custom_line patch which adds possibility to place the text anywhere on the screen by x/y coordinates. Thanks for your comments/feedbacks, if there is anything, just write me. i replaced the normal rockbox build with your build because the track names dont display properly, i was hoping this would help; however, now when i load rockbox i just get a that says "No Files"
Don't worry, it is because you have to reset the rockbox settings because in my builds I've added a few things to the config which get saved, so just "turn on" you hold button on start and everything should be fine. I can't seem to get the theme to display properly. I have installed using your patched zip files but the words and such are not displaying in correct spots. I think your problem is that you or aren't using the latest theme or the latest build. So please make sure to redownload the build and the theme package too and install both on your ipod and everythig should be ok.
and unpack it to your ipod, if I remember it right it should go into the .rockbox/fonts/ directory. Say that i am oblivious to anything that anyone is talking about and i ask the question how do i load themes if that is even what they are called? I already have rockbox with bootloader2. HEY, JUILIUS YOUR THE BOMB... not really a bomb... your Awsome!!!! keep up the good work.!! Your build doesn't work. I get a "No partition found. Connect to USB and fix it" message. I was really looking forward to the 5g theme. I'm pretty sure it doesn't work cos it's outdated since almost a year :) but the patches that I wrote were picked up by other developers (fortunately, thanks to them!) so these themes can be used with other builds like the EvilG build (fusion version if I remember) and there are themes around with the modification required for the latest patches so please browse around in the Custom Builds thread in the rockbox forum: forums.rockbox.org and you should find everything needed to get them running.